Ocean acidification is already making it harder for fish to find friends, for corals to grow, and formussels to remain attached to hard surfaces, just to name a few effects. Now, new research reveals that it may be taking a toll on sharks' ability to track prey. A team of researchers recently found that acidic waters cut adult smooth dogfish (Mustelus canis) sense of smell. Researchers simulated climate forecasts for 2100 in tanks and filled them with the scent of squid, a favored prey source for smooth dogfish, and found that the sharks didn't effectively respond to the scent in these projected conditions. "The sharks' tracking behavior and attacking behavior were significantly reduced. Sharks are like swimming noses, so chemical cues are really important for them in terms of finding food," Georgia Institute of Technology assistant professor Danielle Dixson said in a news release. To carry out the study, researchers tested 24 sharks in a 32-foot long pool with two 'lanes' like in a swimming pool. Researchers pumped squid odor down one lane, and normal seawater down the other. The sharks were then divided into groups and spent time in holding pools with either normal, mid, or high concentrations of carbon dioxide, without food, before being put back in the pools with squid odor. When released, the researchers found that the sharks in normal conditions spent more time on the side with the squid odor. The opposite was true for sharks that spent the five days in high CO2 concentrations-these sharks spent less than 15 percent of their time in the water stream containing the squid odor, indicating that their sense of smell was impacted. The researchers used only odor because sharks can locate live prey with other senses, like detecting electrical impulses. This way, they were only testing the sharks' chemical senses. Additionally, the researchers pumped the odor through bricks to give the sharks a target to attack. They found that sharks treated under mid and high CO2 concentrations reduced their attack behavior. "They significantly reduced their bumps and bites on the bricks compared to the control group," Dixson said. "It's like they're uninterested in their food." Previous studies have shown that acidic waters disrupt a specific receptor in fish nervous systems, making fish less able to detect certain odors. This is the first study, however, to test a shark's ability to sense the odor of their food under highly acidity conditions. Additional research is required to determine how their other senses may react to increasing acidity. Smooth dogfish are found from Massachusetts to Florida in the U.S., as well as in the Gulf of Mexico and possibly the Caribbean Sea. 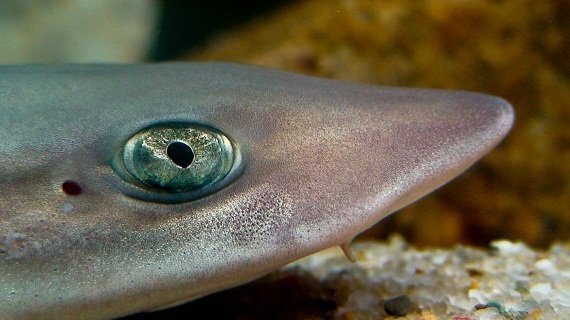 The brown-gray-yellow sharks can grow to about five feet long and have large eyes. They're common along bays, continental shelves, and inshore waters.